The first air display of what promises to be another busy year at Duxford was the Jubilee Air Show, celebrating the Queen's Diamond Jubilee. 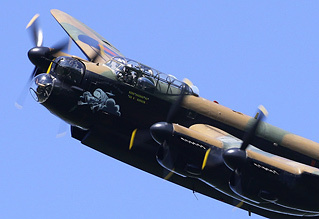 The display line-up was the usual Duxford mix of classic aircraft, warbirds and modern military machinery, all of which had links to the Jubilee theme. Support from the Royal Air Force was strong with the Belgian Air Component and the French Air Force also participating. Stuart Norris reports from the Imperial War Museum. 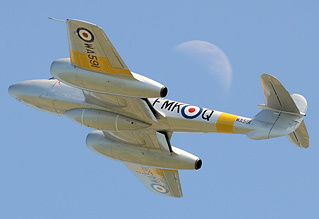 Photography by the UK Airshow Review team as credited. The show was blessed with pretty much perfect weather; clear blue skies all day long and a breeze gentle enough to take the edge off the soaring temperature. The flying started at 14:00, the RAF's returning Typhoon solo arriving from Southend to open proceedings. The Typhoon was not on the airshow circuit last year due to the conflict in Libya and its comeback after a year's hiatus is most welcome. That said, the display seemed a little high and distant. This may have been caused by the aircraft not operating from Duxford, but there were some impressive sections to the routine including the descending spiral. The most eye catching RAF display aircraft was the Tucano, its new Jubilee paint scheme really standing out in the bright sunshine. Other RAF aircraft in the display were the remaining trainer fleet of Tutor, King Air and Hawk, as well as the Battle of Britain Memorial Flight and a rare Search & Rescue demonstration from the Sea King HAR3. Royal Navy participation came in the form of a single Lynx. 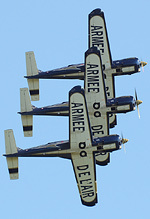 The show saw a number of firsts, the most noteworthy of which was the relatively unknown French Air Force display team Patrouille Cartouche Dore making their debut on the UK mainland. Flying three Socata TB30 Epsilon aircraft, it was a good routine of precision formation flying, but probably would have benefitted greatly from some coloured smoke. The Red Bull Matadors made their first appearance in their new SBACH 300s and their display was even tighter than it was when they flew the Su-26. Captain Renaud Thys gave his first public demonstration in the Belgian Air Component F-16 and was the star of the show for many. 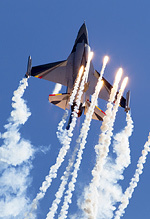 The routine showed the Fighting Falcon to great effect, including plenty of afterburner, plenty of flares and all whilst keeping it close to the airfield at all times. Classic aircraft included a Rapide, Anson and a pair of Chipmunks. The four aircraft made a formation pass before breaking into their displays. One of the Chipmunks, WP903, was the aircraft in which Prince Charles learned to fly. A Jungmeister provided a somewhat tenuous link to the other big event in the country this year, the Olympics, with the commentary team pointing out that the Jungmeister flew at the 1936 Berlin Games for those who hadn't made the connection. Meteor T.7 WA591 returned to Duxford after her stunning debut at last year's October show and was even better this time, pilot Dan Griffith offering ample opportunities for great photographs in the sunshine, including many tremendous views of the much sought after topsides. Warbirds at the show came in the form of B-17 'Sally B', a pair of Harvards, a Hawker Hurricane and a pair of Hawker Nimrods. The Hawkers made one formation flypast before breaking with the Hurricane giving a solo display and the Nimrods flying a pairs routine of their own. 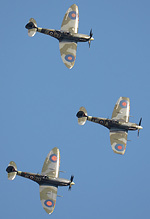 A trio of Spitfires closed the show in fine style; a beautiful sight and sound in the early evening light. The show was a great start to the season at Duxford with the line-up offering something for most tastes. That, along with the weather, attracted a sizeable crowd of more than 17,000 people. 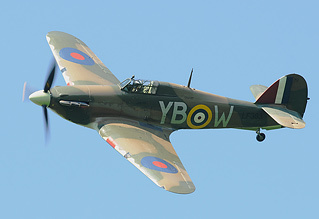 The next show at Duxford is Flying Legends on June 30th and July 1st.